Cheque for the sum of £250 was presented to Bradford Central Lions Club by The Weaving Shed, Victoria Mills, Shipley, Bradford last night. 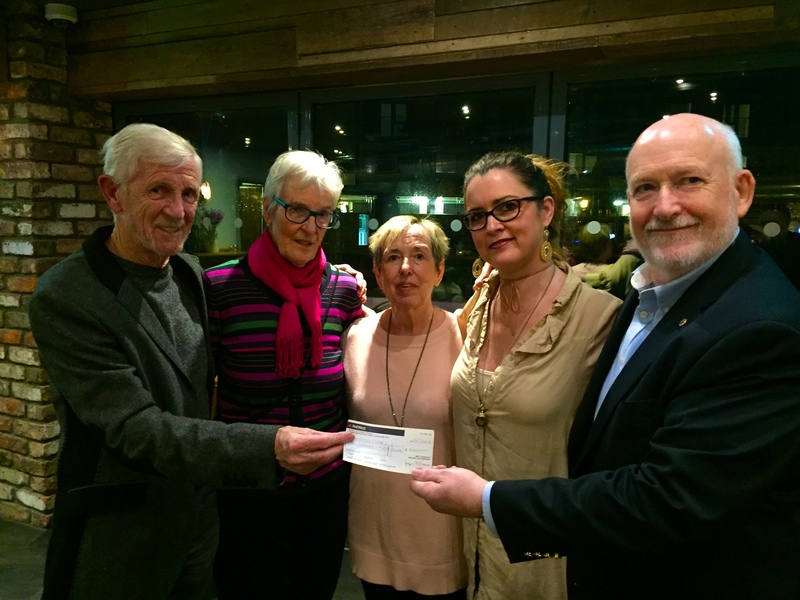 The money was raised by the customers in memory of Late Sean Murphy who was a member of Bradford Central Lions Club and a regular at The Weaving Shed. Late Lion Sean was an active member of the Club who liked helping those less fortunate than ourselves. Lion Sean’s wife and the customers decided to donate the amount raised to Bradford Central Lions Club’s various Charity projects. Bradford Central Lions Club is part of the world’s largest service organisation, Lions Clubs International and has been operating in Bradford since 2013. In addition to their other projects they also have ongoing Food Bank Project. On average 20 Food Parcels are given out every month. Photograph shows Frank Thompson (Customer), Carole Murphy, Joyce Thompson (Customer), Alexis who runs the bar and 2nd Vice President of Bradford Central Lions Club, Clive Meggison. Bradford. BD7 4RS, West Yorkshire.